The Mabinogion looms very large in the culture of Wales; as Niall Griffiths notes in his afterword to The Dreams of Max and Ronnie, it follows him wherever he goes to write “like luggage”. Given this presence, it is perhaps surprising that it took so long for a publisher to commission a contemporary reworking of these classic myths and stories, to breathe new life into them and bring them to a modern audience and readership. That is exactly what Seren Books have now done in their developing range, “New Stories from the Mabinogion”. In October 2009 they presented the first two books of the series – White Ravens (based on Branwen, Daughter of Llyr) and The Ninth Wave (a retelling of Pwyll, Lord of Dyfed) – and followed them up with The Dreams of Max and Ronnie and Gwyneth Lewis’ The Meat Tree in October 2010. The Dream of Max and Ronnie is a contemporary version of two of the ancient tales from the Mabinogion – The Dream of Rhonabwy and The Dream of Macsen Wledig. The Dream of Rhonabwy tells the story of a warrior on a quest with two companions, who visit a dirty hovel in search of shelter. The three men settle down for the night, with Rhonabwy resting upon a yellow ox-skin that is said to bring luck to those who sleep on it. While his companions pass an uneventful night, he sleeps for three days and nights, and dreams of visiting a gathering army commanded by King Arthur, of knights and chess players and fighting in the mud of the River Severn. In Griffiths’ vision of this story, we travel with soldier Ronnie, about to be shipped off to Iraq and looking for something to calm his nerves. He and two compatriots visit the house of a local drug dealer, who supplies Ronnie with a tranquiliser so strong that he falls asleep on a yellow blanket in her living room for three days and nights. While his fellow soldiers wait for him to wake, Ronnie is transported to a strange place in his dreams, where he meets an army being mobilised under the command of Winston Churchill, and men playing violent video games while squaddies around them die, acting out those game images for real. In the second part of the book, we meet Max, the modern reincarnation of Maxen Wledig (the Roman Emperor Magnus Maximus, who ruled between AD383 and AD385). This is a classic tale of an Emperor dreaming of a beautiful woman, who is so saddened by her absence when he awakes that he sends his messengers out across his Empire to search for her, eventually finding the future Empress on Mon (Anglesey). Maxen stays with his love until his rule over Rome becomes forfeit and he must travel with her family to fight for it back and cast out the usurpers. Max, on the other hand, is the owner of a nightclub called Rome in a South Wales city, who falls into a drink-fuelled slumber and dreams of his perfect woman, who lives in town with a harbour and a castle across a land of mountains. Knowing he must seek her out, he sends his gang of followers and dealers out to find her, eventually tracking her down in North Wales. The Emperor’s battles to prevent the loss of his lands are paralleled in the threat to Max’s dodgy empire from a rival gang in the North, who seek to take over his patch and the money he makes in dealing and fencing there. As a writer who has previous form in describing seedy underworlds, altered states and dodgy characters, it is perhaps not surprising that Griffiths takes the two dream myths and moves them to grotty, dingy settings with unlikeable leads. The root of each story is clear to see in each retelling, with the updating taking a realistic format (or as realistic as a modern fairytale can be). It is just as believable that the terrified squaddie Ronnie would want a means to blot out his forthcoming tour of duty as would be for the warrior Rhonabwy to fall asleep by magic, for instance. The tone of each story is different, though. While Ronnie’s dream is full of angry satire on the treatment of soldiers as cannon fodder by leaders who want to go to war to preserve their prestige and the celebrity-obsessed tribes of modern Britain, Max’s story is more darkly comic. Lovers of satire will probably find much to like in Ronnie’s tale, although I did prefer Max’s story of the two. The writing style was not the sort of thing I normally read, and so I found it took me a while to really settle into the stories being told. I’m not sure quite what I was expecting, but a very edgy style of writing that spells words how they are pronounced in slang and dialects, and which eschews quotation marks to easily define where there is speech left me a bit baffled at first. I found that until I really adjusted to this I had to re-read passages to ensure I had got the correct meaning from them, something I am not used to having to do, and I did find it a bit frustrating. That I enjoyed the second story more than the first is probably as much to do with the fact that I had grown more used to interpreting the prose as the content of it! The book is fairly brief; Ronnie’s story is under a hundred pages in length, while Max’s is shorter still at just 42. While there is extra content to the book in the form of a synopsis of each of the original stories by the series editor and an afterword by the writer commenting on the project, the whole tome amounts to a fairly short read that I consumed easily in two short sittings. I think the idea of reworking such classic tales in one series of regular releases is an excellent one, but I would have liked the book to have a bit more meat about it. Had I have paid the cover price of £7.99 I might have felt a bit underwhelmed at getting little more than two hours of entertainment out of it. A more detailed telling of the original tale and perhaps some more background on the significance of the Mabinogion would have made this a more substantial offering and would have complemented Griffiths’ stories well, I thought. Ultimately this is a pretty good read for anybody who does have an interest in mythological traditions and how they can relate to modern life, but be prepared to be left with more questions about the Mabinogion than answers. After finishing this book, I found myself compelled to go and read more about these stories and myths, which is perhaps a good indicator of it being an intriguing (if not an easy) read. 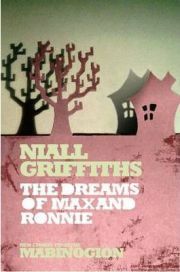 With thanks to Seren Books for providing a review copy of The Dreams of Max and Ronnie. No Comments on "The Dreams of Max and Ronnie"